The work is titled Imposition of Order. Like much of Jeff’s work this piece, a four image panel, is about a dialogue between past and present and future. Jeff grew up between Six Nations of the Grand River Reserve and Buffalo, New York and is now based in Ottawa. The panel images speak to the complex history of these areas of Ontario where he has lived and worked as an artist. 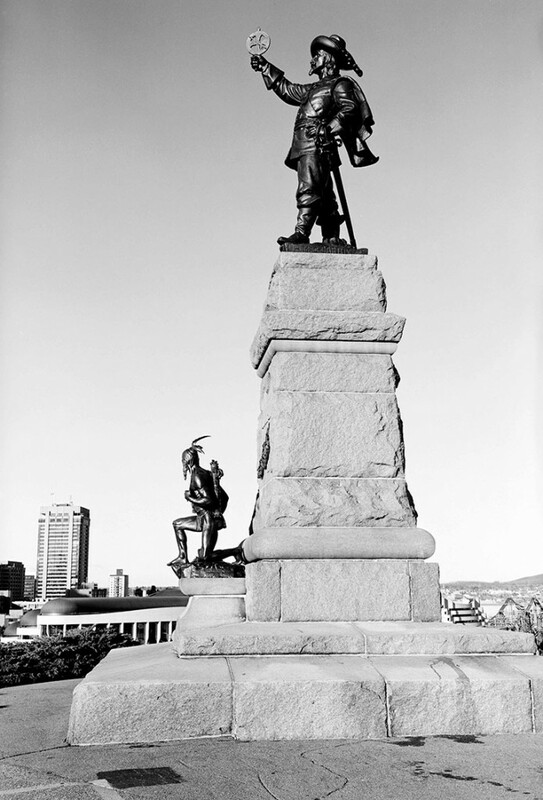 The middle image of the monument of Champlain above the ‘Indian Scout’ at Nepean Point was taken just behind the National Gallery of Canada. Much of Jeff’s work has focused on this particular space and the absence and presence of the now relocated and renamed “Anishinabe Scout.” What does this imply about the absence and presence of Indigenous people in the urban space? The work is a commission for the Art Gallery of Ontario’s (AGO) exhibition Every.Now.Then: Reframing Nationhood. I am looking forward this show’s opening as well as seeing Jeff’s newest work on the streets of Tkaronto!